If you’re around tonight, there’ll be readings of Krista Knight’s High Blonde, a play about city planning and accessibility, and Nate Weida and Ben Holbrook’s musical The Church of the 1st Order of Cloud City’s Inaugural Unity Jamboree, which is not about the art space in Williamsburg. Sure, this show is at the more uptown location of UCB and not the one in the East Village, but maybe you have a job or something to do uptown and it’s on your way home anyway. Judging by the lineup, this edition of comedy website Reductress’s recurring live show will be worth the trek anyway. Hosted by Eva Victor and Taylor Garron, the folks trying to elicit both “haha” and “wow” from you this time around include Rachel Pegram, Ruby McCollister, Taylor Ortega, Sam Taggart, and Shalewa Sharpe, who you may remember from her recent Tonight Show segment about Black Panther, which was tweeted out by Chadwick Boseman himself. According to the some version of the transitive property, maybe you can tweet about this show and then you will become a movie star. Who knows. Let’s face it, most people nowadays are probably more likely to worship a celebrity than any actual deity. 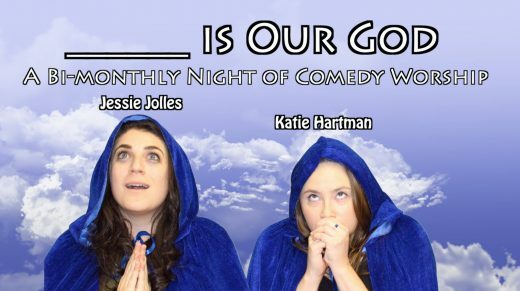 Instead of ignoring that fact, the hosts of Blank is Our God, Jessie Jolles and Katie Hartman, have decided to embrace it fully. Their comedy variety show, which doubles as a worship service, asks comedians and other performers to pay tribute to a different pop culture icon every two months. This time, it’s Kevin Bacon, and yes, they will be serving actual bacon, with turkey and vegetarian varieties available. “When there was only one pair of footsteps in the sand? That was Kevin Bacon carrying you,” the show’s description states, and you know, there’s no way to prove that it wasn’t. You guys have heard of 4:20, but what about 6:20? 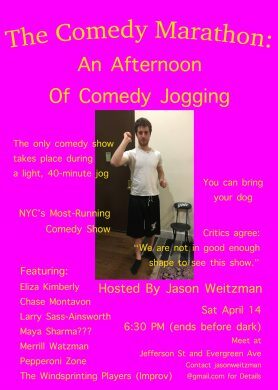 Ok, I’m burying the lede here, the reason I’m listing this show isn’t because of the start time, it’s because it literally takes place while jogging. Ok, ok, I hate all types of fitness too, but I’ve been told this show only takes place during a “light jog,” so I’m going to have faith that it won’t be too exhausting. Ideally, it will give you the satisfaction of getting exercise and seeing some good comedy at the same time. Think of it as like when you watch a show on your phone at the gym or something, if that’s a thing people do, except this time you’ll actually be supporting real live comedy. So, join host Jason Weitzman and a gaggle of amped-up stand-ups and improv teams for a comedic adventure through Bushwick. Apparently you can register online and get one of those pieces of paper you put on your chest during a real marathon, so really, what are you waiting for?